• A Microchip insider tells all on the newest, most powerful PICs ever! The new 16-bit PIC24 chip provides embedded programmers with more speed, more memory, and more peripherals than ever before, creating the potential for more powerful cutting-edge PIC designs. 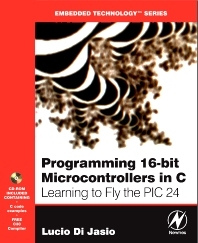 This book teaches readers everything they need to know about these chips: how to program them, how to test them, and how to debug them, in order to take full advantage of the capabilities of the new PIC24 microcontroller architecture. Author Lucio Di Jasio, a PIC expert at Microchip, offers unique insight into this revolutionary technology, guiding the reader step-by-step from 16-bit architecture basics, through even the most sophisticated programming scenarios. This book’s common-sense, practical, hands-on approach begins simply and builds up to more challenging exercises, using proven C programming techniques. Experienced PIC users and newcomers to the field alike will benefit from the text’s many thorough examples, which demonstrate how to nimbly side-step common obstacles, solve real-world design problems efficiently, and optimize code for all the new PIC24 features. You will learn about: • basic timing and I/O operations, • multitasking using the PIC24 interrupts, • all the new hardware peripherals • how to control LCD displays, • generating audio and video signals, • accessing mass-storage media, • how to share files on a mass-storage device with a PC, • experimenting with the Explorer 16 demo board, debugging methods with MPLAB-SIM and ICD2 tools, and more! ·A Microchip insider tells all on the newest, most powerful PICs ever! Take off…The most dangerous phases of flight… take off and landing. The parallel with learning a new development tool and possibly an entirely new language … We learn about the C30 compiler (student version) and we start developing code for the new 16-bit families of dsPIC and PIC24 microcontrollers. Lucio Di Jasio is now Sales Manager in Europe for Microchip Inc.
"No stone is left unturned. The book hits flash memory, communications, LCD support, and analog-to-digital converter support...Unless you are a C30 and PIC24 wiz already, pick up this book before beginning work with one." William Wong, Electronic Design.